The book does a splendid job of making Catullus accessible to students. Includes Carmina 2, 3, 5, 8, 13, 31, 45, 51, 65, 70, 72, 75, 76, 85, 86, and 101. 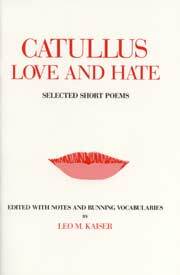 This offering of 17 selections, mostly, but not all, Lesbia poems, is designed to make Catullus available to students ‘at the earliest feasible stage.’ To this end Professor Kaiser provides a generous reference to older English poetry written under Catullus’ influence, and a variety of quotations, including a dozen or so poetic selections, intended to document the literary merit and influence of Catullus.